Since starting this whole Paleo experiment, my wife and I have gotten really into making our own stocks and bone broths. I read all about how the collagen and gelatin in bone broth has been shown to decrease joint pain, increase mobility of the joints and just help our bodies be flexible and move well. Making broth using the bones of the animal is an age-old process that has largely fallen out of practice because nobody's grandmas are around with a stock pot bubbling away at all times, and the knowledge of the benefits of this practice have largely been lost. Of course, people who are into Paleo are all about bringing back old ways of eating and cooking, so this is right up our alley! 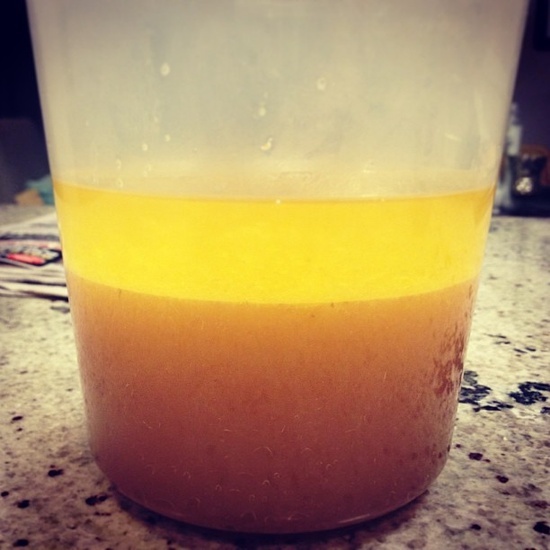 What I want to talk about in this post are the various attempts that we've made to make good bone broth, and show how it's kind of a hit or miss process. In principle it's easy. You put veggies and bones into a pot with water and you cook it for a long time... How hard could it be? Now, just so we know what we're looking at here that's about an inch deep layer of beef fat on the top. That's ridonculous. Down below you have the stock which carries all of the gelatin and collagen that was pulled out of the marrow of the bones through the cooking process. All of this came from bones that normally people would just toss aside, but our source for grassfed beef, Kookoolan Farms, allows us to take big bags of the bones from our animal home with us for just this purpose! Most people don't take advantage of this, so right now we've got a lot of bones in our garage chest freezer. The thing that worked so great with this batch is that the stock was concentrated enough to get gelatinous, which means you actually got the collagen and gelatin out of the bones. If you cook it too high, or without the right ingredients, or for too long you wont get the same result, and you won't have taken full advantage of the nutrition from the bones. It took several tries to get this right, but we finally found Aglaee Jacob's tips (heard her talk about her super simple method on the Underground Wellness podcast she was on) and it worked great. The differences were the inclusion of vinegar, and not using too much water. The recipe seems simple, but we found it really helpful compared to others. She also talks about the correct slow rolling boil you want to have the broth going at while you cook it. Basically you want it to be bubbling along, but not at a full boil. We had trouble with this on our gas stove because even one little adjustment of the dial causes the flame to grow or shrink considerably. It was tough to find the middle ground, but we eventually did and it was awesome! If you have access to animal bones through your meat supplier, or if you eat a ham, whole chicken or bone it beef cuts, save the bones and make broth! BTW, it's also delicious! I didn't even talk about that, haha. Underground Wellness, Top 5 Reasons Bone Broth is the Bomb. Nice! Glad you got it dialed in. For some terrific ideas for how to actually use and enjoy all that goodness, check out the book "A Long Way on a Little" by Shannon Hays. Awesome! Also, a slow cooker/crock pot works great for this (I had the same issue with temp control on the range). I also use it for poultry bone broth & stocks.